Ideal for the professional or hobby pastry chef or cook. Suitable for any kind of chocolate and even couverture chocolate. Easy to make homemade chocolates for kids'' birthday parties, small get together. 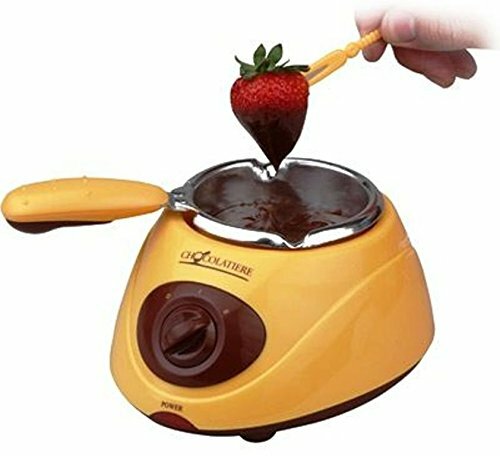 Electric Chocolate Melting Pot by Good Cooking- Perfect for melting, drizzling, and dipping your favourite chocolate, our chocolate melting pots come with over 30 accessories and 12 recipes so your favourite treats taste even better. Melt up to a cup of chocolate at a time without water, and use the fruit skewers, fondue forks, spatula, handling fork, truffle dipper, and metal cooling rack to perfect your favourite delicious snacks. With 7 unique moulding trays included, you can get creative with your treats as well. Perfect for anyone who loves chocolate or trying new delicious snacks! Comes with over 30 accessories, including 7 chocolate moulds, fondue forks, and more! Melts chocolate perfectly for easy pouring, dipping, and drizzling 12 recipes and 7 unique moulding trays included inside!